When it comes to practice, many musicians may be familiar with the "10,000-hour rule." The theory was popularized by author Malcolm Gladwell and suggests that it takes roughly 10,000 hours to master any particular skill. Want to become an expert archer? Ten thousand hours. Formula One race car driver? Ten thousand hours. A master sheep herder? I think you get the point. Thanks to this theory, musicians everywhere have hit the practice rooms with furious determination in hopes of racking up the hours. Let's take a second and do some math here. According to Google, there are roughly 8,700 hours in a year. It's unlikely you'll spend all those hours holed up in a room with bleeding fingers. For the sake of discussion, let's assume you dedicate one hour a day to practice. Even then, it's going to take some time to reach that 10,000-hour mark. This is not to discourage you. By all means, go for it. However, if you're going to put forth that much effort into something, you should be certain to do it right. 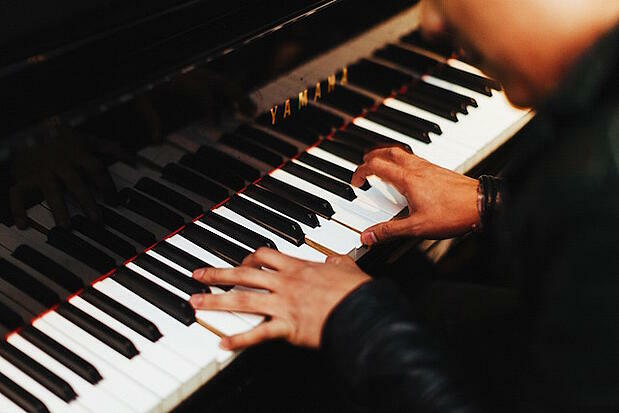 In the case of music, mastering an instrument may not be how many hours you put into it, but instead, how you go about the method of practice. There are more efficient ways to practice than simply counting the hours and repeating lessons. Not so coincidentally, that happens to be our topic of discussion today. For anyone who has taken music lessons or witnessed someone else practice, it's likely that a great deal of "mindlessness" was taking place. Think about those times you've practiced and try to recall what it was really like. If you're like most people, then you'll realize that repetition is a common theme in practice methods. Playing something over and over until you get it right is popular for a reason. For the most part, it tends to get results. It helps create a disciplined response to learning music and help you target mistakes and fix them. Mindless practice like this can be beneficial in small doses, but there are a few major problems with it as well. For one, repetition can be a waste of time. Have you ever practiced a piece for hours straight (days, even) and still feel like you haven't learned anything? Perhaps you've even gotten worse. How is that possible? When you're practicing on autopilot like this, it tends to reinforce bad habits and errors. This will help you mess up more consistently in the future and make it difficult to fix bad habits you've developed through repetition. This can be a waste of time because you're just adding the number of hours in the future needed to fix the bad habits. Additionally, this tedious form of practice can hinder your confidence. After putting forth many hours into practice, it's fair that one should expect results. However, the results may not be showing themselves which, in turn, hurts confidence. Even if you're nailing a piece 75 percent of the time, it's still not perfect. Ideally, we'd like to go onstage and ace that part on demand, but with mindless practice, that not's possible. When practicing mindlessly, you're not really conscious of your actions. When getting onstage, however, musicians tend to perform consciously, or at least attempt to. By practicing unconsciously, you're only making it that much harder for yourself to perform consciously. Ultimately, you're just working against yourself. There are enough factors working against you in the music industry already. You don't need to work against yourself as well. To fix this, you might want to consider a more mindful approach. Odds are you've heard about practicing mindfulness from your Buddhist neighbor, your hippie roommate, or that potentially crazy philosophy professor. The amount of "hard science" behind mindful practice is fairly nonexistent, but many successful musicians swear by it. Mindful practice is actually not the loopy, transcendental experience you may think. It's actually a highly organized and structured activity. Instead of going the mindless route and practicing trial and error, mindful practice helps you become more active in the process of experimenting while combining clear goals and ideas. Think of practice as a science experiment of sorts. You're free to test different ideas, musical or not. By doing this, you can clearly see what combination of strategies gives the best results. Like mindless practice, mindful practice involves repetition, but in a different way. Mindful practice is slow, thoughtful, and specific. For example, say you're practicing a solo. The mindless musician would repeat that solo until it sounds like all the notes were hit. The mindful musician would spend some time perfecting the opening notes of that solo to ensure it has a profound and meaningful effect. Another way to take part in mindful practice is through monitoring your performance. By listening to yourself, both on record and in real time, it's easier to see where you can improve. You have to really listen hard to what happens. From there, it's easier to pinpoint the notes of error. Maybe a certain note was too long, too loud, or too sharp. By monitoring your playing, these errors can be picked up and modified. At first, you may notice that mindful practice is quite tiring. It takes a great amount of focus and energy for what is ultimately a minor improvement. For this reason, it's important to practice mindfulness in small doses. It's not like you can shut off your brain and repeat sales until the sun rises. More than a couple of hours at a time will become quite draining, so it's important to break up your exercises to prevent burnout. It'll be hard to shake off your old habits of practicing harder. Usually, when something isn't going as planned in practice, the tendency is to just pick up the effort and try harder. With mindful practice, however, that's not necessarily the case. Instead of practicing harder, try doing so smarter. There are other, more effective ways to accomplish a musical goal if one strategy isn't working out. By repeating the same method harder and harder, that will only damage your confidence, and potentially your fingers. When you feel you may be getting a bit frustrated, force yourself to stop practicing altogether. But that doesn't mean go crack a beer and relax. Instead, try thinking of different solutions to whatever problem you may be having. If it helps, grab a pen and paper and record any ideas that may come up. If you feel you came up with a few potential solutions, then just start trying them out. Many may not work, but over time, you'll find a solution that speaks to you. Once it does, move on to the next conflict and repeat the process. Mindful practice may seem like a painstakingly slow process, but in the end, it'll make practicing a more fulfilling and substantial experience.